"The Tale of a Punch-Clock Mage"
In a world where everyone has magic, very few develop it. Join Tristan Sodden, a newly minted mage. It follows him starting on his new job as a Junior Mage and dealing with various ordinary problems such a red-faced bosses, irrigation and what to have for dinner. Mage Life has not been tagged yet. Help others find Mage Life by tagging it! 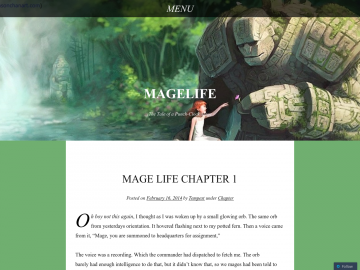 Mage Life has not been reviewed yet. Mage Life has not been recommended yet.